Droid Transfer gives you the ability to transfer music from your Android device to your computer. Check out our other pages if you need to transfer music from computer to Android, or using iTunes with Android. Or visit our TouchCopy page if you need to copy music from iPhone to computer instead. Click the "Music" tab from the feature list. Select where on your computer to save your music to. Droid Transfer makes it easy to copy songs, albums and artists from your Android device to your PC. Simply connect your Android to Droid Transfer on your Windows computer (follow our Quick Start Guide if you need help). Next, open the "Music" tab from the features list in Droid transfer. This will display all your music. 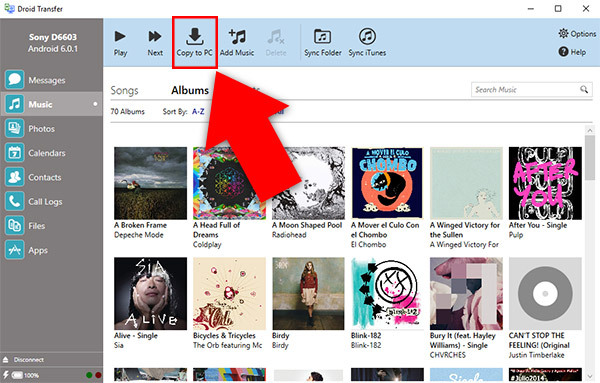 Select certain songs / albums / artists by holding the 'ctrl' key on your keyboard while clicking multiple items. Once you have made your selection, click "Save to PC" from the Droid Transfer tool bar. Tell the program where you would like to save the music files to on your computer, then hit "Save"! There are a number of ways to narrow down your music search in Droid Transfer. Get specific music results by using the "Sort by" or "Genre" options, or use the Search bar if you know exactly what you are looking for. On a broader scale, you can view your music by Song, Artist, or Album by clicking the relevant tab heading located just below the Droid Transfer music toolbar.